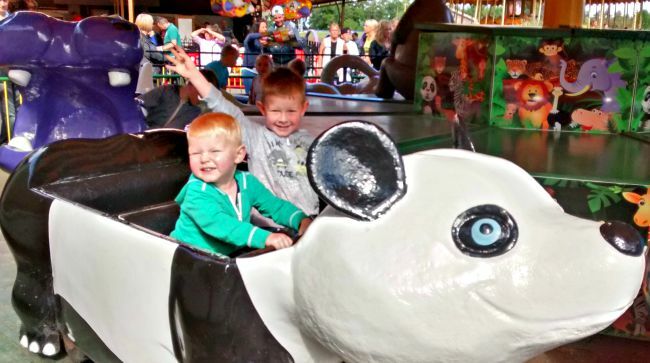 The first time we went to Lightwater Valley, my boys were aged 5 and 2 so we were looking for a theme park which didn’t have too many scary rides, but still had plenty for little ones to do. We were really impressed with the number of the rides available at Lightwater Valley for small children, so we were delighted to be invited back to see how the park had changed in 3 years. There are over 35 rides and attractions at Lighwater Valley ranging from thrilling rollercoasters to more gentil family fun. 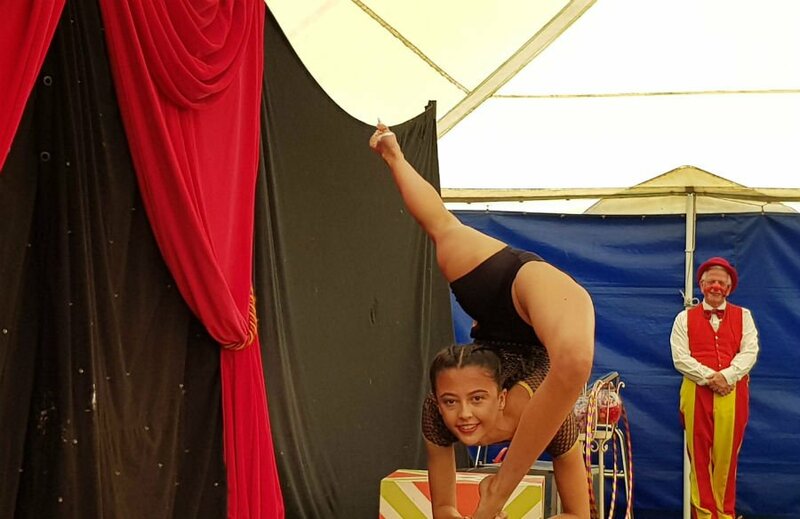 The price of entrance tickets is based upon the child’s height rather than age, which is fairer as it means you won’t have to pay a lot for smaller children who won’t be able to go on as many rides to get in. Children aged under 3 are free and children under 1m in height are only £8 each if you buy your ticket in advance. The good thing about Lightwater Valley is that height restrictions are included next to all the rides on the park map. This makes it really easy to see, at a glance, which rides are suitable for toddlers and pre-schoolers so you can plan your day accordingly. 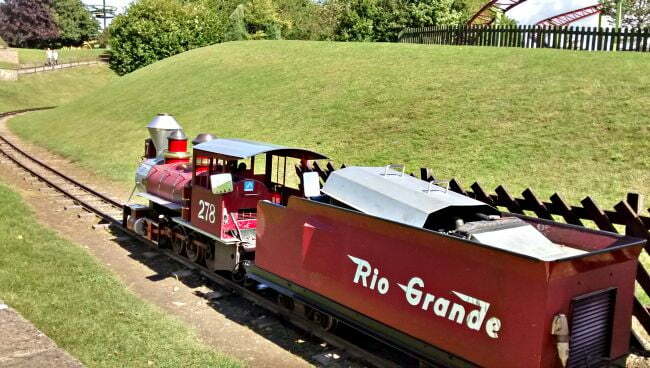 There are a few rides just inside the park entrance which are suitable for toddlers such as Noah’s Ark, Lady Bug and Space Pirates, but my top tip would be to jump on the train which runs around the park and make your way to the Whistle Stop station at the far end of the park and start there. If you get there at opening time, you will find that the rides at the far end of the park are quieter and the queues will be shorter. 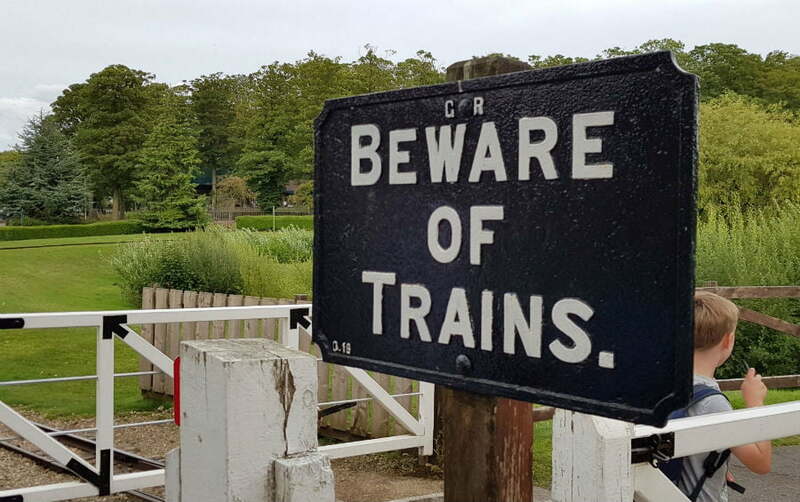 Plus, you will get your bearings as you travel round the park on the train. NB – There is a carriage at the end of the train which takes pushchairs. At the other side of the theme park, there are loads of rides for little ones including the Spinning Tea Cups, Mini Ferris Wheel and The Vintage Car Rally where children can drive a car! The Ladybird and Little Dipper are little rollercoasters which children over 1m in height can go on if they are accompanied by an adult – lots of fun, and often this is a preschooler’s first time on a rollercoaster! 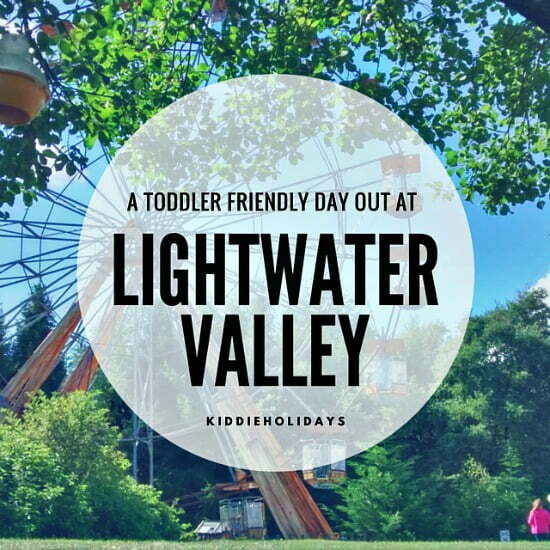 There are also lots of other rides which toddlers and pre-schoolers over 1m in height will love going on at Lightwater Valley including the Wild Water Rapids, The Carousel and the Mini Diggers. For a bit of quiet time, you can have a ride on the Swan Boats which are open from May half term onwards. There are also lots of other attractions at Lightwater Valley in addition to the rides. This is a massive interactive play area which my boys absolutely loved. They spotted this as soon as we arrived, and were asking all day when they could go and play in the playground. They loved the slides, tubes, climbing walls, poles and rope bridges and spent ages playing here. It was a nice sunny day when we visited, so my husband and I were quite happy to sit on the bench around the playground watching them play. 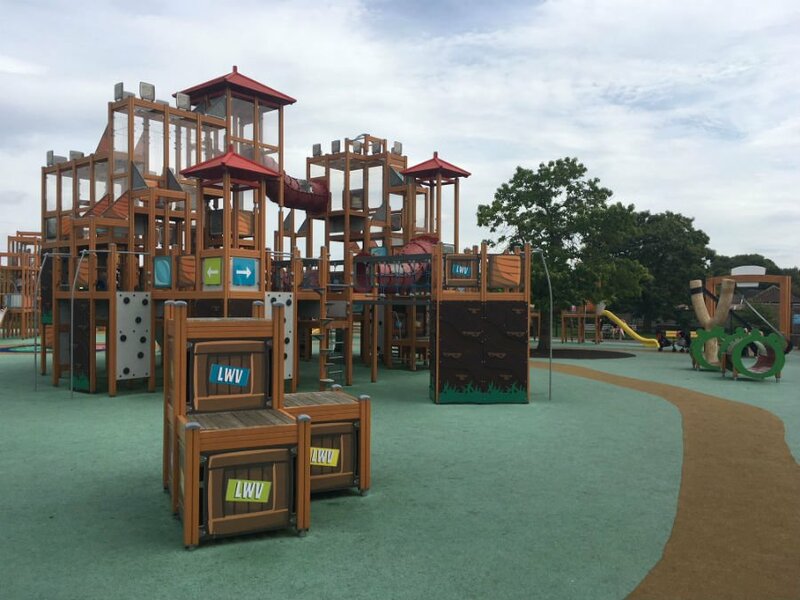 The ground of the play area was made out of really soft spongy material so it was perfect for toddlers who may be a bit unsteady on their feet. The circus was in town during our visit to Lightwater Valley. There were 3 shows a day, and at just 30 mins long they were the perfect for time for toddlers and young children. 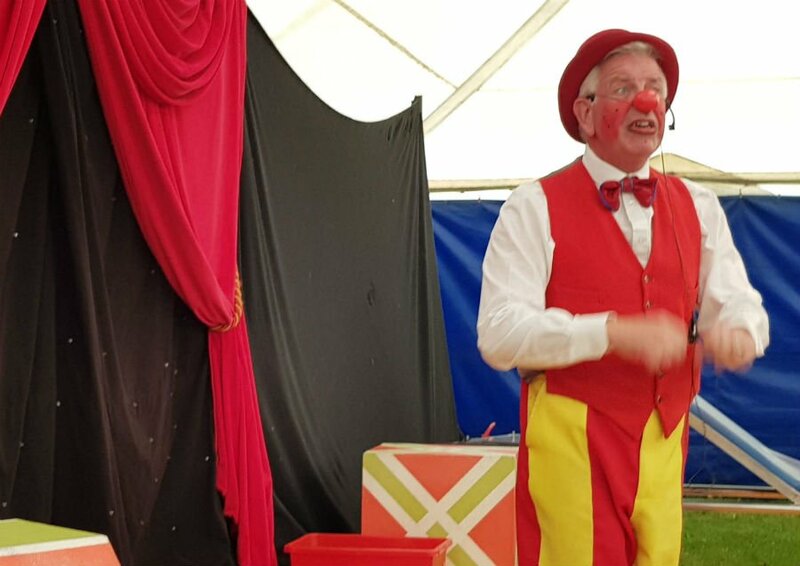 There were clowns, upside down jugglers, an amazing contortionist and lots of water and custard pies! My boys really enjoyed exploring the Bird Of Prey Centre which is located next to the Play Area. Here you can see a wide variety of species of owls and other birds of prey, and watch them fly during the Falconry Sessions. There are also other (non bird) animals at the Birds of Prey Centre too including rabbits and snakes which you can see too. Animal lovers will love jumping onboard one of the Eagle Creek tractors, and going on a ride around the Lightwater Valley farm. You can see pigs, ponies goats and donkeys from the comfort of your own tractor! There is also a soft play at Lighwater Valley which is jungle themed, and has a Café. The soft play is split into 3 separate zones; Under 1s, 1 – 3 year olds and 3 – 7 year olds. Lightwater Valley is quite big so little legs will get tired. Therefore, I would definitely recommend taking your pushchair. All the paths are pushchair friendly and there are plenty of places to leave your buggy when you are on the rides. As mentioned, you can jump on the Train to get around and put your buggy on the Buggy carriage. There are loads of food and drink places at Lightwater Valley so you don’t need to take a picnic if you don’t want to. Alternatively, if you do take a picnic, there are loads of picnic tables and grassy areas to eat. In fact, the area around the lake where you can go on a Swan boat ride was quiet and perfect for a picnic. There are dedicated baby changing facilities which are listed on the park map. There are plenty of toilet facilities throughout the park. Lightwater Valley don’t sell baby food but will happily warm people’s up for them. Just ask the staff in the food outlets. Mums are welcome to breastfeed anywhere in the park but if they would prefer a private room then they are welcome to pop to Visitor Services where there is a private room with sofas. It is cheaper to book online in advance via the Lightwater Valley website. The entry prices includes entry to the theme park, Falconry Centre, outdoor play area, Circus & Falconry Flying Demos. There is plenty of parking and it is free. Lightwater Valley gets busy in the school holidays, so I would advise arriving at opening time. Thank you to Lightwater Valley for our tickets for the day.